In an important home ice matchup looking for a huge response to the sub-par California road trip, the Rangers (41-24-8) came back to form with a 4-2 win over the Florida Panthers (40-24-9), despite some late scares. Alain Vigneault and his squad corrected many of the problems they had on the road trip. The shots and possession were drastically improved and very even. The Rangers actually were the ones dominating play for the first 30-40 minutes. And while there were still some defensive miscues, it was nothing close to what we had seen for most of March. After a disappointing California road trip that exposed many of the team’s flaws, the Rangers (40-24-8) enter the home stretch with just 10 games remaining, playing three of the next four games at MSG. 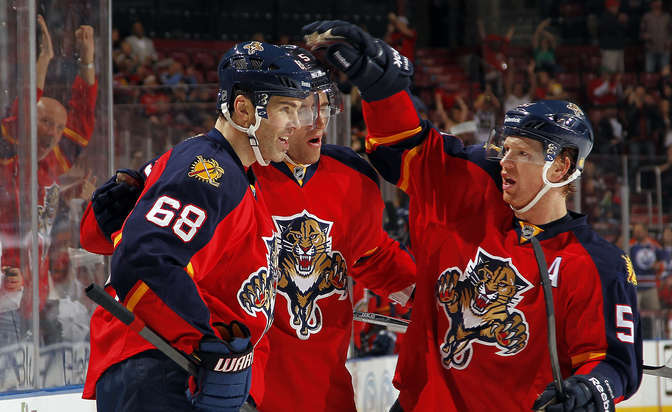 They start tonight against the Florida Panthers (40-23-9), who sit in first place in the Atlantic Division. In their last game out, Henrik Lundqvist kept his team in the game for a long time despite being completely outplayed. The Sharks totaled 52 shots on goal, two times as many shots as the Rangers had, and scored four times. That put the Rangers at 3-4-2 in the last nine games.